For trolling large bunker spoons, we recommend a conventional rod and reel combo consisting loaded with 40-50lb Monel wire line or 80-130lb braided lines. Braided line is easier to use, but will not have quite the same sink rate as wire. 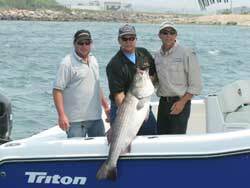 It is critical to use a rod specifically designed for spoon fishing with wire line. Bunker spoon rods are typically 8ft or longer and fairly soft. The slow soft action allows the spoon to have the proper beating action. The reel should is typically 4/0 size or larger. Levelwind reels are nice to have, but are not critical. The reel spool should be made of a material that will resist corrosion because the wire line accelerates that process. We spray all our reels frequently with a corrosion inhibitor. The wire line should always be backed with monofilament and typically joined with an albright knot. A 10ft long 80lb fluorocarbon leader of should be attached directly to the wire using an Albright knot or an 100lb swivel. If a swivel is used, it should be small enough to easily pass through the guides. A variety of 9 inch Secret Spoons in different colors are effective and these are the only spoons we recommend. Click here to learn more about using bunker spoons and the Secret Spoons! Watch the video below to learn how to select the most effective colors.